Wednesday was so ridiculously hot and humid. As I was getting ready to head out, I idly wondered if it would feel hotter because they’d told me we’d reach a heat index of 106 degrees, or it would actually just *feel* that hot. And then I went outside, and it was just plain hot. My ride started with a quick mile and a half up the hill and over to the YMCA where I exercised in air conditioned comfort before heading home and swapping out bikes for the much hotter ride to campus, by way of the MARC train. It was the kind of hot where the wind going downhill feels like it’s blowing from a furnace–no cooling there. The train ride was nice and cool, but then, the uphill to campus. Again, it’s only two or so miles, but the uphill combined with the heat made me feel like I couldn’t even breathe. I practiced the techniques I’ve been learning from meditation–notice how you feel, don’t judge it, just sit with it–nah, still too damn hot. I felt like a red-faced, sweaty badass once I made it to the office, though, and it was down hill on the way home, mostly, so there was that. I was pretty much a wrung-out dish rag by the time I carried the bike up the stairs at Penn Station, and the blast furnace hit me in the face as I exited for the ten or so blocks up the hill to home. No way, I thought to myself. No. Way. 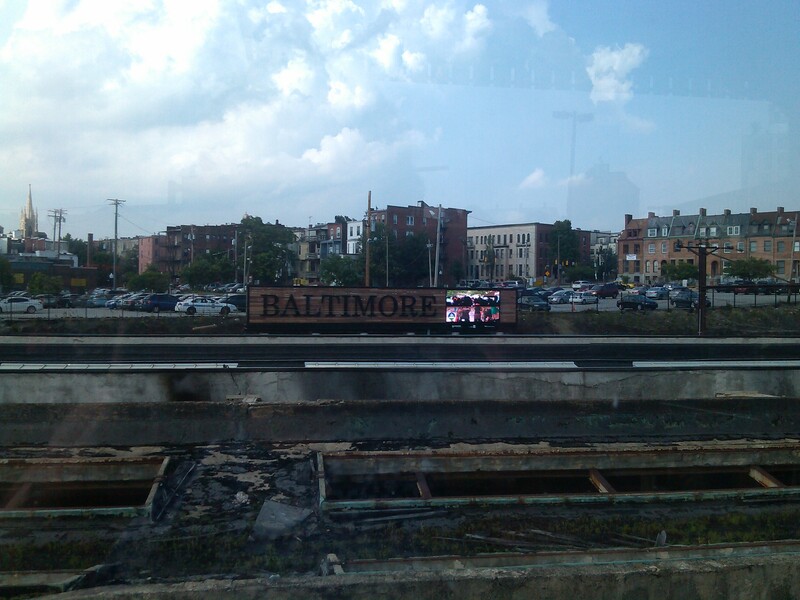 I sighed, turned to the right, noticed they attached a giant flat screen TV to the new BALTIMORE sign that greets train riders entering the city now. Yeah, that TV will totally keep people from noticing OUR ENTIRE CITY IS CRUMBLING RIGHT BEFORE OUR EYES. And then I reluctantly strapped on the bike helmet, stepped on, and rode the granny gear all the way home, stopping for water three times. I was hit by a single raindrop at 25th and Charles–didn’t help at all. Summer riding is here, and I’m not quite acclimated yet, I guess. This entry was posted in weather and tagged Baltimore, Halethorpe, heat waves, MARC, summertime, weather. Bookmark the permalink. God, but I love your blog, your stories and you.